With thanks to Rev. 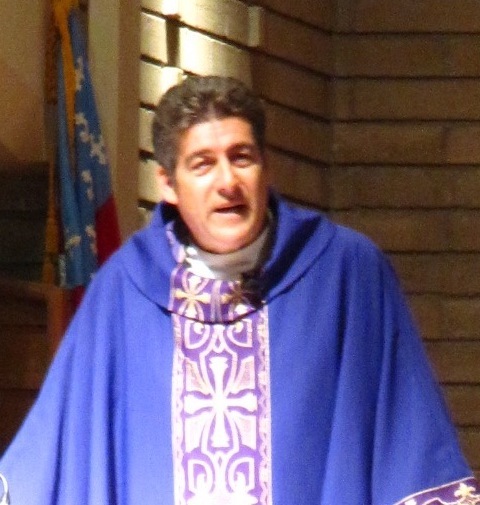 David Gierlach, Rector, St. Elizabeth’s Episcopal Church, for permission to publish his sermon 12/2/2018. Today is the first Sunday of the Advent Season. Hence the purple. Purple for the royalty of Christ. Purple for the wounds our Christ endures as he seeks to teach us what it is to be truly human, beings. And throughout Advent we have these strange readings that are all about not only endings, but THE end of life as we know it. Strange readings because — isn’t Advent all about getting ready for a beginning? That beginning being the birth of the baby in the manger? And the answer is yes — and no. Advent does lead us into Christmas morning, but Advent is not primarily about that. Advent is primarily about helping us cope with — and helping us realize — that we live in in-between times. We live between the time of Our Lord’s birth and his final coming. So with in-between eyes, let’s sit with today’s gospel for a moment. This strange gospel warns us of roaring seas and frightening signs in the sun, moon and stars, the very shaking of the heavens! How shall we hear such warnings? Are they simply old fashioned ramblings that 2000 years of come and gone history shows to be merely that, just ramblings? Many people today are convinced that life exists only between the moment we exit the womb until the moment we take our last breath, that we come from nothing — and to nothing shall we return. So any talk of a returning Jesus is pure nonsense. Others seize on these gospel words with complete literalism. They give us charts and graphs that calculate the exact day and time such things will happen. These are the premillennialists and postmillennialists who are counting down to the rapture. There are those who support Israel not out of love for or admiration of our Jewish mothers and fathers, our elders in the faith; but rather because they believe Christ’s return can be forced upon God — once an all out war begins in the Middle East.But perhaps the way Jesus intends us to understand these words is not as ramblings nor as fortune cookie predictions of the future, but to read this, and all of our Advent lessons, through the eyes of poetry. It was Billy Collins, the poet laureate of the United States over 20 years ago, who pleaded with us to approach poetry as “a beehive to listen to, as water to ski across, as a dark room in which to feel around for a light switch.” He made that plea after discovering that too many folks simply want to dissect and analyze poetry, to “tie the poem to a chair with a rope, and torture a confession out of it.” If we hear again today’s gospel not as ramblings, but as poetry, perhaps we shall hear something of the undeniable terrors of life — terrors that, in the end, no one avoids. Perhaps the terror that comes to your life is that diagnosis of cancer or dementia, of a stroke or a heart attack. Perhaps that terror is the loss of a beloved spouse, or a beloved child. The terrors in life that are pregnant in the poetry of Jesus may be a collapsed economy, like the one that is currently destroying Venezuela; a collapse that our own nation barely escaped a decade ago — one we may face yet again in the months or years to come. These terrors may be war, as the suffering children of Yemen die by the thousands from starvation, as Syria seeks to rebuild from little more than rubble. 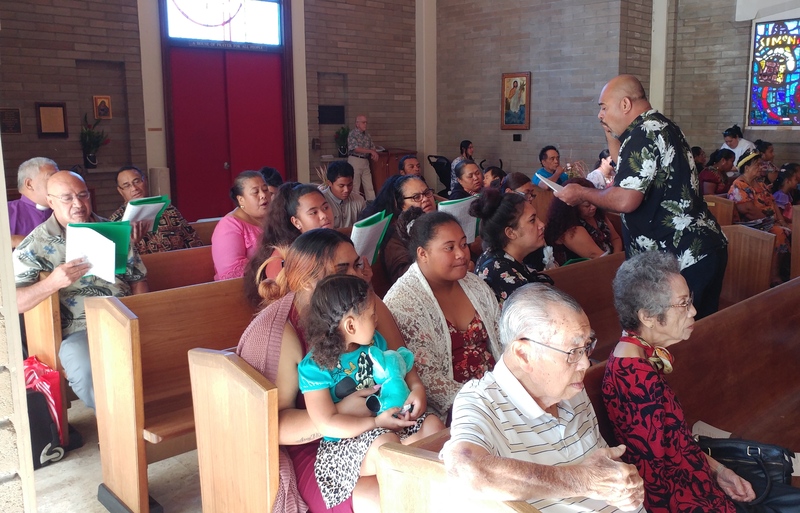 The Tongan choir: a highlight of the Holy Eucharist at St.Elizabeth’s Episcopal Church. It begins with preparation. Which is why we are here today — which is why we show up each and every week — to prepare — yes, as individuals, but even more so as a community, for whatever terrors may come our way. We hear the word, we sing songs, we recite the deep truths of our faith, we confess our sins, and we take in — through the bread and wine — the body and blood of the one who assures us that all shall be well. But these steps, our participation in the rituals of our faith, as important as they are, are not the end; they are in fact only the beginning of our preparation. As we continue our spiritual journey, what we come to see is that the key to spiritual maturity is something we normally flee from: that key is surrender. Surrender connects us to Christ – heart to heart — mind to mind — gut to gut. What surrender helps us begin to glimpse is the very thing life’s terrors keep us blind to — yet it is the truest thing in all of creation. It is the glory of God. “Oh, the depth of the riches both of the wisdom and knowledge of God! How unsearchable are His judgments and unfathomable His ways! For who has known the mind of the Lord, or who became His counselor? Or who has first given to Him that it might be paid back to him again? For from Him and through Him and to Him are all things. To God be the glory forever, the One who ’raises the dead and calls into existence the things that do not exist.’ (Rom. 11:33-36; 4:17). That glory doesn’t wait for tomorrow! We catch glimpses of God’s glory, we see for a moment the fruit of our faith, every Saturday morning at breakfast in the hall. This marvelous ministry that the Lino family gave birth to and that the loving hands of so many continues — sees on a weekly basis not only the hungry fed — but this rainbow of God’s people, Anglicans, Mormons, Romans, Pentecostals and Unitarians and Baptists and Jews, coming together as one, and we are all graced with a peek inside the banquet hall of God. We catch a glimpse of God’s glory in the Tuesday hot lunches served by the Catholic Workers and the many community members who join them — where it’s not only about a hot meal or a bag of groceries or freshly washed and folded laundry — but it’s about taking the time to talk story — to learn from each others stories — to see those in need not simply as “those in need” — but as sisters and brothers — as fellow travelers on this road of happy destiny. The terrors of this world, when they come face to face with the glory of God, well, that is the poetry of Advent.